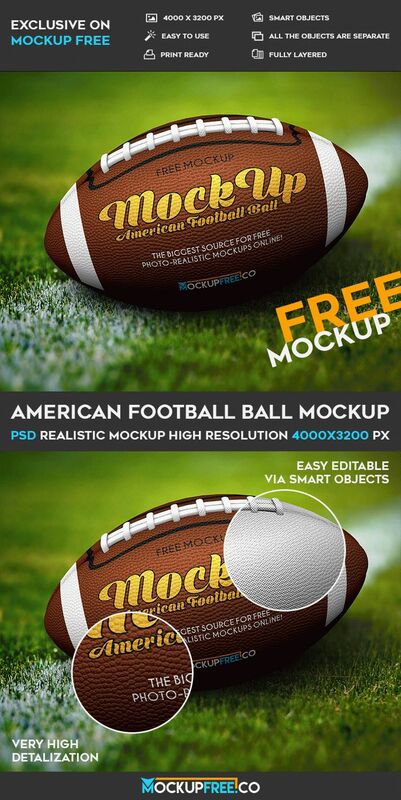 Download our new Freebie: American Football Ball – Free PSD Mockup! This Free mockup can be very useful for different companies, for creating product advertisements and of course for being original and interesting for future clients and partners. It is easy to add there the necessary design and create presentation, promote the product you wish and look professional for your clients and customers, if you are a designer. It is important to know that this free PSD football ball mockup can be customized in Photoshop without any problems. Open this fully layered file in this program after free downloading and change colors, add the necessary design and of course use the best background and text if needed. Easily download this qualitative American Football Ball – Free PSD Mockup for implementing your professional ideas, for showing the necessary design to your clients or customers and for lots of other interesting ideas and aims you have. If you think that this free PSD mockup is necessary for your project, choose it and use the way you wish!